How many times a week do you visit a restaurant? It is really very hard to avoid the sumptuous meals from your favorite restaurant. No matter how tough you try to follow the recipe at home, you cannot recreate the same version and rush to your favorite place to meet craving of your taste buds. 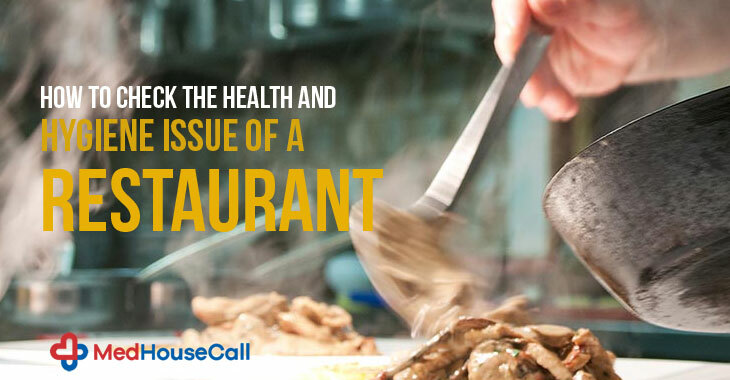 While the occasional dine out will not harm your health, a frequent visit is not a good option. Many restaurants do not follow the hygiene guidelines and it attacks directly to your health. MedHouseCall improves the healthcare field with their innovative approach to the on-demand doctor calls. They revive the old health care process and try to fit into the modern health care needs which are based on the convenience. We come up with some important factors that you must check before choosing your favorite restaurants. As per the reports, many trusted names even fail to maintain standard hygiene in the environment. Do you love sausage rolls and meat sandwiches? But have you checked the time of preparation? If your restaurant does not mention it, they violate the rule of hygiene. They must provide every detail so that you will be aware of anything and everything about your food. Some restaurants forget to maintain the basic things in their environment. Have you checked their coolers? You will find it packed with items and wastage. Sometimes, food remains uncovered there. The best names always maintain the right policy for their customers. They have separate employee health and hygiene policy to protect the environment from bacteria and germs. They also have a cleanup kit for bodily fluid. A restaurant owner can also go an extra mile to win the trust of customers with a food handler certificate. You can also check the environment and determine the cleanliness of the place. All employees must wear a ball cap or hair net. The kitchen area of a restaurant must not have any personal items as they borrow germs with it. In a sanitizer bucket, there must be a wet towel. Clean food storage is the first step that welcomes customers to a healthy eating zone. Restaurant owners must discard any food stored in a two-door cooler for more than four hours. All food items must be covered in a walk-in cooler. Need to wash hands frequently. Must have food handler certificate for all employees. So, these are some basic things that a restaurant owner must maintain for keeping the environment clean. You will also check a restaurant’s rank on cleanliness on review sites. MedHouseCall is offering health care facilities to your house. Our home visit physicians often raise awareness on health and hygiene factor because this is a source of various health problems. Our aim is to improve the health care facility so that everyone can avail the premium health services.